I'm working on a romantic suspense novel about some attempted kidnappings in a small town that is based on some actual events in my life. I am working on a YA dystopian novel. It is my first book, and I am having a lot of trouble getting the plot to line up right. Thanks for the awesome suggestions. I have been struggling with the opening for my latest book, and feel this is just what I need to try! My current WIP is a Fantasy Romance. I have my characters pretty well fleshed out but I'm having issues weaving the Plot and sub-plots. In some instances I'm not sure which plot a scene would work better with. 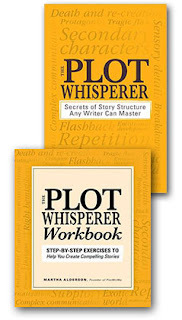 I've heard great things about The Plot Whisperer and it's companion workbook. If I don't win them I plan to buy them. Although I write predominantly nonfiction, I find books written for fiction, especially those that help you plan a piece, crossover nicely. After all, unless you're writing journalism style, nonfiction needs to be engaging and read well. My current WIP is a horror series about vampires. I'm working on revising the first book in the series. I would love to win The Plot Whisperer and the companion book. I believe they would help me with plot issues I seem to be having. I'm working on a "who rescued who" story about how a loner has her life changed by a mutt she rescues from a rest stop. I'm working on character development and setting researching. I love writing technique books that offer solid, helpful advice; this sounds like another good one! And I'm currently working on another edgy realistic YA suspense novel. Thank you, Sue, for the terrific review of the PW books!!! I love learning how the process of creating a plot planner works for writers. That following the exercises gave you new insights into your story and fired up your imagination and energy to write thrills me no end. I'm working on my first novel, a contemporary YA male POV, about a teen with recurring nightmares who must figure out to regain his dignity, or face the person behind his debilitating dreams. Currently working on a structural edit, after an R&R, several full and partial requests, and an offer to publish with a small press. I've heard amazing things about TPW. Please help my MS find completion. Thank you for the opportunity. I'm working contemporary and suspense romance novels. This sound like what I need to add depth to some of my plots/sub-plots. Martha Alderson taught a half-day session through SCBWI at Dominican College. She's terrific! I have used Alderson's books when I was prewriting, writing and rewriting and found them helpful each time. Thank you for your comments, everyone! I'm working (on and off) on a contemporary YA. Thanks for this generous giveaway! Working on a middle grade fantasy. This giveaway is wonderful and would be perfect in helping with my novel. Today I took a break from editing a novelette collection to edit a short story I wrote for a competition last night. Nice to add some writing (yesterday) into all of the editing! I am working on a love story between a jaded travel writer and a timid first-time adventurer. Been working on this for over a year! Main WIP is a historical YA mystery set in rural Australia in 1939. Love the videos. I'm working on a YA paranormal thriller. It's my first book and it sounds like Martha Alderson's books would be perfect to help me straighten out all the subplots I have going on. Nothing at the moment, I'm still gathering ideas. I am working on a post-apocalyptic YA about a young girl who escapes from a cult in pursuit of her exiled brother. I would LOVE to win this!! I'm currently working on a PB, but could really use this for a MG I have in my mind! I was about to buy this as an ebook, and was checking it out, throughly, like I do! So glad to find this contest and I love WOW. You have wonderful teachers. I NEED this book! Ive been stuck and it sounds like it would def help get me over this hump! I am ordering this NOW! Sounds like a great resource any writer can put to practical use. I am currently working on a Christian book series about a family that lives in a pretty rough city neighborhood and work together to help their community improve for the better, while also dealing with their own life situations.